Panaya Success Center How to import Tests from file? 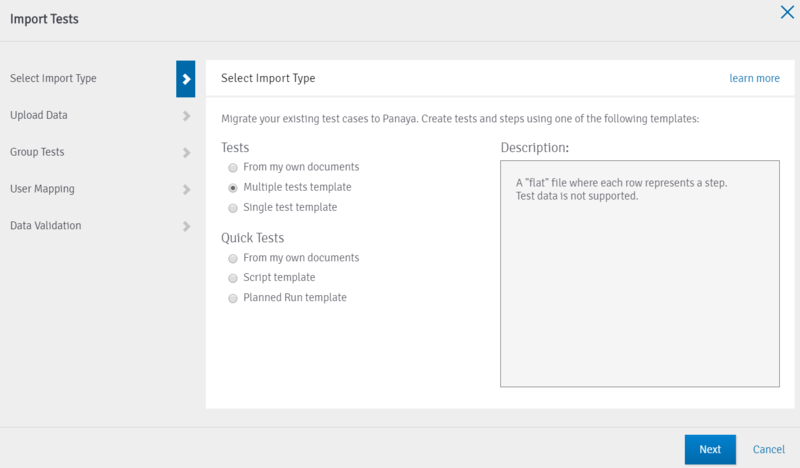 Panaya provides a simple to use Import Wizard for importing your tests. This is the fastest and most efficient way to import your test assets. If you wish to import tests from another Panaya project, click here for instructions. Using this option will redirect you to Panaya's Test Box. The Test Box allows the automatic creation of tests from your existing assets. If you select this option, the wizard will proceed to the Upload Data page, where you can download the Panaya flat excel template. This will allows you to add or paste tests and steps into one flat excel for all test activities. Select this option if you wish to use a seperate Excel file for each test. To upload multiple tests in this method, you will need to archive all the files and upload them as a single ZIP file. You can import MS Office files of your own. Panaya will create a new Quick Test activity for every imported file. The name of the file will be used as the activity name and the actual file will be added as an activity attachment. PDF files are not supported when importing Quick Tests using this method. Use this if you need to create detailed instruction activity steps with the expected results. The template enables to define the a Section for your script - 1 section for each Quick Test. If you use TCODE names in the transaction field for the section, Panaya will identify it and consider them for Test Coverage reports. This template allows to create Quick Tests and include their Planned Runs. Quick Test will be created with no attached script. You can later record or create it manually. You can use this completed flat excel example for Planned Runs as a reference. You can use this completed flat excel example or a single test per file example spreadsheet as a reference. Go back to Panaya. In the Import Wizard, click on Select Files... and locate the template file or the archived ZIP. 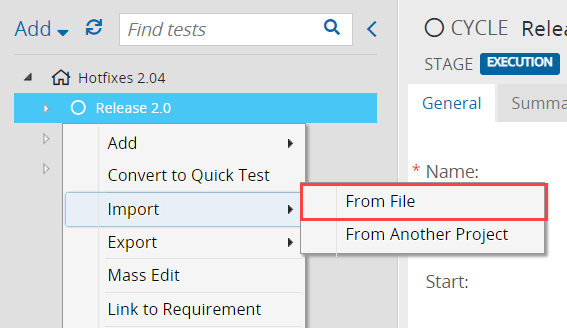 If you wish, you can specify fields to set the folder hierarchy for the imported tests. Up to 3 hierarchy levels are supported. You can grouping tests by clicking Next. Click Next to proceed to the User Mapping section. When Importing Tests into Panaya, the Wizard allows to assign users in the template file to the relevant users in Panaya. Business Process – if you wish to combine several tests under one business process. The Test ID column data will appear as the Catalog ID of each Test. The Catalog ID can be viewed or changed under the General tab. How does Panaya calculate the Test Coverage? What are the differences between a Standard Test and a Quick Test?